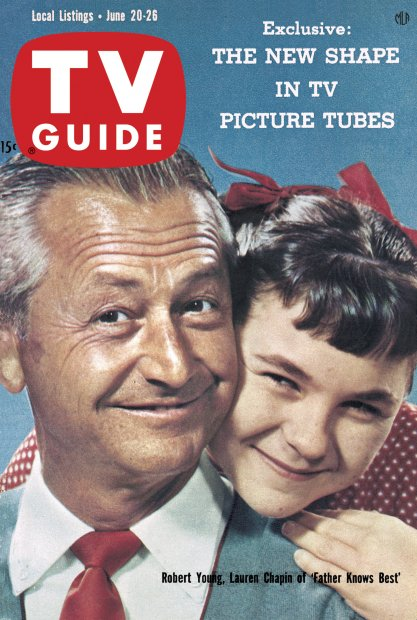 [T]he show has received requests from 22 organizations for personal appearances: a New York life insurance company (Jim Anderson, Young's character, is an insurance salesman), the U.S. Army Recruiting Services (Young and co-star Jane Wyatt appeared on the Army float in the 1958 Rose Parade), the National Safety Council (Young views his work for them as a year-around job), and the Mount Sinai Hospital and Clinic (recognizing Young as Father of the Year, "a title twice bestowed upon him by the National Father's Day Committee), among others. The show, winner of three past Emmys, is seen in 21 countries, and is a smash in Australia. Well, come a year later, little has changed for Young, who has just returned from a trip to Toronto, where he addressed the Canadian Highway Safety Conference on the media's role in traffic safety. It's one of the effects of television's ability to bring stars right into the living room, where they're virtually a part of the family. "There is a tremendous difference in the public's attitude," Young says. "In the movies they were either overawed and silent, or they wanted to claw you. In TV they regard you as a known friend and are not hesitant in stepping right up to engage in conversation." Young is up to around 1,000 requests a year from bona fide organizations, most of which he has to decline - if he accepted even a fraction of them, there's be no time for the television show. And this brings up something else that Young has noticed, something that's taken a bit of getting used to. "At first, when I began to realize how seriously people took me in Father Knows Best, I was badly frightened. Understandably perhaps, I began to think the character was me. My wife finally brought things into focus. She advised me to know who I was and who Jim Anderson was and not to confuse the two." Added to this, Young is by nature an introvert, who is now finding himself pushed into all kinds of situations outside of acting, situations that nobody could have foreseen. "They may be suited to extroverted Jim Anderson but they are not necessarily suited to me. I am inherently shy. I don't move easily in a crown. So I had to do some serious work on myself in order to meet the requirements of what was expected." Reading this can cause one to ponder how the stars of today react to such attention. Some of them, of course, will loudly proclaim that they are not role models and shouldn't be taken as such. Some will become mysterious recluses, seldom seen in public and somewhat surly about it when they are. Others will use their celebrity in order to pursue political agendas, going even so far as to appear in front of Congressional committees to testify as "expert witnesses," based either on their familiarity in general or on authority derived from the television roles they've played. Raymond Burr did a lot of the latter, addressing bar association conventions because of his familiarity to the public as Perry Mason. However, if there is a difference between then and now, it may be because Burr's appearances, for example, were often designed to communicate to groups of attorneys how they were perceived by the public, the kinds of responsibilities inherent in being a lawyer and maintaining the public trust, things like that. I may be wrong, but I don't know that Burr ever went to a group and lobbied for the Miranda warning. Have times changed as much as they would seem - have movie and television stars entered a different dimension when it comes to how they exploit their celebrity? And do we see them in the same light? I know that fanmags, with their constant references to stars by their first names or nicknames, add to the delusion that we actually know these people, but in general do we still find stars as approachable, as much a part of the family as they were when they first entered our living rooms? Or have we become too cynical for that nowadays? On Friday, President Eisenhower and Queen Elizabeth II are in Montreal for the ceremonies commemorating the opening of the Saint Lawrence Seaway, a joint venture between the United States and Canada that started in 1954. CBS and ABC are on hand to present live coverage beginning at 9:00 am CT, while NBC has taped coverage later in the day. 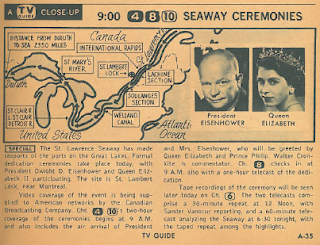 The Canadian Broadcasting Company provides the video for all three networks. The Seaway runs from the Gulf of Saint Lawrence, on the Atlantic Ocean, all the way through the Great Lakes and to Duluth. As I recall from my grade school history, the early explorers searched for an opening that would run the length of the continent, connecting the Atlantic and Pacific, but of course they never found it, and eventually they'd have to settle for the Panama Canal. I've no doubt a project like this would garner a fair share of attention from the news channels today, but the networks? Someone once asked me why I was interested in the '50s and '60s; I gave several reasons, but one of them was that it was a time when we still had the capacity to be awed by technology and human achievement. * The Empire State Building. Boulder Dam. The Houston Astrodome. The 1964 World's Fair. Today? Meh. That's what cynicism does to you. *From anyone other than Apple, that is. Saturday night it's the 21st Mrs. America Pageant, coming to us from Fort Lauderdale, Florida. This article details the colorful history of the pageant, including its journey from a "cheesecake" contest (Miss America for married women) to its current status as an event "celebrating the homemaker." The customary trappings of a beauty pageant would be replaced by "contests of household skills like ironing, cooking, baking, sewing, and cleaning," Now, I'm sure that these qualities are vital when it comes to homemaking, but I don't know that contests like this make for the most riveting television. The pageant, which began in 1938, petered out in the late '60s, only to be revived in the late '70s, with its purpose “to recognize the single most discriminated against person in the history of international beauty competition: the married woman.” However, what with the need for marketing and promotion and whatnot, the pageant has returned to something more like a conventional beauty contest; as a spokesman once pointed out, "you can be beautiful and still be married," and a look at previous winners indeed confirms no shortage of pulchritude. The pageant continues happily to this day from its home in Las Vegas (natch), with this year's show scheduled for August 27. The winner of the June 20, 1959 pageant - Mrs. America for 1960 - is Margaret Priebe of Iowa. Here's a story on the trials and tribulations of being Mrs. America. In a somewhat related note, on Wednesday The Donna Reed Show (9:00 CT, ABC) portrays the difficulty a mother has when she tries to do it all. Here's Donna's dilemma: "Dr. Stone is scheduled to read a paper before the medical society and says it's important that Donna be present. But on the same night Jeff wants his mother to watch him play basketball and Mary is about to be initiated into a girl's club." I have no doubt Donna makes the right decisions, but in these days when the debate continues about whether or not a woman can "have it all," can you imagine how much more complicated Donna's situation would have been if she had to satisfy an outside boss as well? I wonder if Margaret Priebe ever had to deal with situations like this? 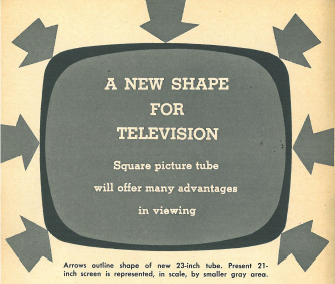 The television tube is joining the ranks of the squares. It's the first change in the basic tube size for almost 10 years, and it's such a big deal some manufacturers are even scrapping their plans for next year's models in order to conform to the new shape. If you're familiar with the changing shapes of the TV Guide logo over the years, you'll know what this looks like - "square corners, straighter sides and top, flatter screen surface, much closer to a perfect rectangle." In the case of a 21-inch tube, this amounts to an extra 20-square inches of viewing surface. Because of the change, this will now be known as a 23-inch tube. And yet, even though it's billed as close to a "perfect rectangle," anyone who's watched classic TV from the '60s and '70s on DVD knows this isn't quite the case, for on occasion you can still see a little bit of black creep into the corners on a given shot - not at all visible on TV sets of the era, but a charming reminder today of the advancements that have been made since then. In the front of the programming section (the "News and Notes" part of the issue), a couple of reminders that we still live in an era where ad agencies call many of the programming shots. For one thing, the job of Head of Programming for CBS is up for grabs. The pay is $70,000 per year, more than what I make today, and I'd guess there are probably a few fringe benefits in addition. And yet, no luck filling it so far, even though the job has been offered to top TV execs at three ad agencies. Why? "Although the CBS spot pays well in prestige the salary plus possible stock options are considerably under what the ad agencies can afford to pay in salary and bonus." The position has also been offered to the legendary Pat Weaver, former president of NBC and currently a consultant to several sponsors. He'll turn it down as well, probably for the same reason. If I seem to mention the Quiz Show Scandals frequently, it's only because they pop up so frequently in the TV Guides of this era. Right now, a grand jury is looking into the matter, and the presiding judge, Mitchell D. Schweitzer, has ordered it impounded, saying the jury has gone into areas they're not allowed to pursue. Specifically, "they have inquired into so-called fraud, but no crimes have been found to be committed and there are no public officials involved." As it stands, Judge Schweitzer won't make the report public so as not to smear the reputations of those mentioned in it, and challenges the district attorney "to show legal reason why I cannot do what I have done." 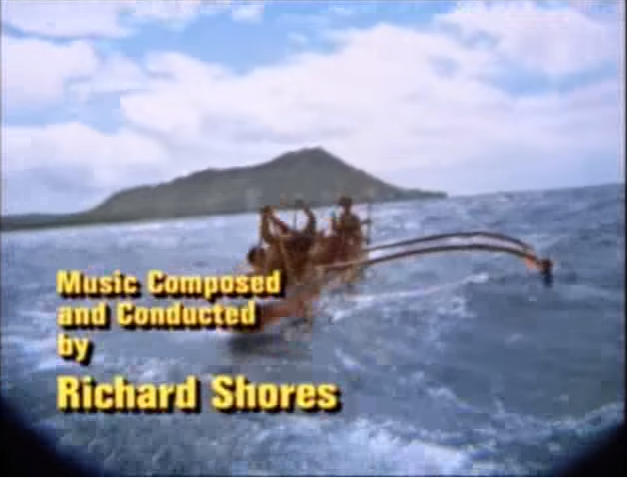 Also, we have another piece of evidence as to how television has changed from its early days. The amount of prime-time programming devoted to filmed shows, as opposed to those broadcast live, now nears 70%, with about $170 million worth of programming to be filmed between now and next May. 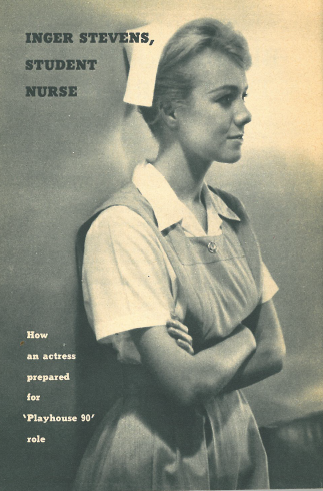 Finally, we have a pictorial (sadly, not in color) of the painfully young-looking Inger Stevens, all of 24 years old, spending some time at Cedars of Lebanon Hospital in preparation for her role as a nurse in an episode of Playhouse 90. This type of research by actors isn't unheard-of, but some of these pictures make me wonder just how much of her work was genuine, and how much was merely for the camera. 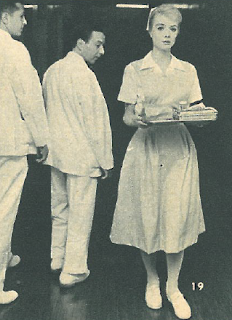 I rather doubt that the photo to the right, in which nurse Stevens is "ignoring the approving stares of two passing doctors," was a candid one, though I have no doubt things like that actually happen. However, the atmosphere of picture below encourages me to think it was taken in an unguarded moment. I realize this might be a pipe dream, but it captures Inger in a moment of reflection, when her youth is most winsome and vulnerable - she could indeed be a student nurse - as well as the beauty that is said to be most apparent when a woman is not aware she is being looked at. Seems to me this is as good a note as any to end on, don't you think? The vacant position at CBS for "head of programming" would go to Jim Aubrey (who a few months later would also become TV network president after Lou Cowan was forced-out as a result of the quiz-show scandals). Aubrey would go on to become the most notorious network executive in the history of American television. His story might be worth telling in a book or an HBO miniseries.